Jill Gardner plans an adopt-a-pet Christmas party at her bookstore/coffee house in South Cove, California. Jill is drawn to Baby, a ten-year-old terrier whose owner was found dead on the beach the week before. Jill is determined to find a home for Baby, as well as learn more about Baby’s owner and what happened to him so there is closure for everyone before Christmas. Santa Puppy. 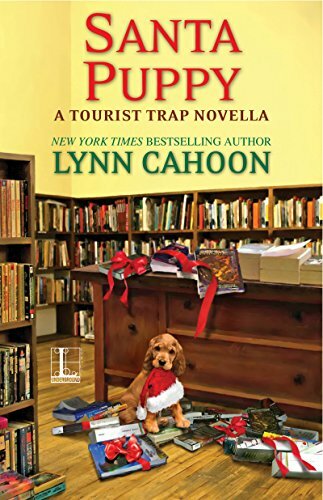 is part of the Tourist Trap Mystery series. I’ve read some of the other books in this series, but this holiday-themed novella is a perfect introduction to readers new to the series. At the center of this book is a love story about a military veteran who knew gave up trying to find the love of his life. His death wasn’t a murder, but Jill wants to find his lost love, as well as a home for his dog, Baby, and won’t stop until she does. I love how dedicated Jill is to her business, her friends and family, and helping others. Her attitude is perfect for a holiday story. The story also focuses on people getting over past losses and making new holiday traditions with friends and loved ones. Reading about Jill make preparations for Christmas from decorating her tree to baking cookies will get you into the Christmas spirit. There is a happy ending in store for many of the pets in the animal shelter, but a bittersweet ending to the story of the veteran and the woman he loved. I really enjoyed reading Santa Puppy. This short, fast-paced novella isn’t about a murder investigation, but new and returning readers alike will enjoy seeing Jill get ready for Christmas while solving a touching mystery.